The story of Theseus and the Minotaur is one of the stranger legends of Classical mythology. But much of the story seems to have a plausible rational explanation, in principle, if not in detail. In some far distant time (as seen by the Classical Greeks) King Minos ruled the Aegean. He demanded in tribute every year a group of Athenian youths and maidens. These were delivered to the Labyrinth, in the middle of which lived the Minotaur, a terrifying creature that was half human and half bull. Once anyone entered the Labyrinth, they could never find their way out again; the Minotaur devoured the youths and maidens as they tried to escape. After many years of this, a courageous youth called Theseus volunteered to be one of the group. When Ariadne, the daughter of King Minos, saw Theseus, she took a liking to him, and helped him by giving him a thread that he paid out after him when he entered the Labyrinth. When Theseus encountered the Minotaur, they fought, and Theseus killed the beast. After escaping by backtracking along the thread, he took Ariadne with him as he left Crete. But he did not go straight back to Athens with her. Instead, he abandoned her on Naxos. Naxos is a large island in the Cyclades about 200 km north of Crete and the same distance east-south-east of Athens. That's the usual version, but Homer, in the Odyssey, says that Ariadne was put into a deep sleep and had to be left on Dia, which is a very small island just off the coast of Crete opposite Amnisos, which was the port of Knossos. There are two threads of probable facts that seem to me likely to underly this strange legend. One is the relationship between Mycenean Greece and Minoan Crete, and the other is the influence of earlier civilizations in Mesopotamia and the Levant (modern Iraq, Lebanon, Palestine, Syria), or even earlier, in Anatolia. Until the explosion of Thera (Santorini) in 1650 BC (discussed in the page about the Atlantis legend), the Minoans controlled the sea trade, and were a dominant cultural influence in the whole Aegean area. They had a refined artistic tradition, and a complex society that seems to have had a rather low priority on soldiering, as compared to other cultures in the Eastern Mediterranean. After the explosion, the administration of Crete seems to have become Mycenean Greek, as attested by the transition of the writing from Linear A (in an unknown language) to Linear B (Early Greek, though some of the symbols come from Linear A), as well as by other administrative and cultural changes deduced from the archaeological record. It is quite possible that Mycenean Greeks might have been a little jealous of the power, the artistry, and the extraordinary craftsmanship of the Minoans before the explosion, whereas afterwards, it was the Greeks who were in control. Pre-explosion Crete contained several large "labyrinthine" palaces (or perhaps temples--or both). "Labyrinth" means a complex in which it is easy to get lost in a maze of passages, and at least the temple-palace at Knossos would have readily qualified, and in Mycenean times, the name "Labyrinth" was applied specifically to that building. But the word may also be related to "Labrys" the double-bladed axe that was as much a religious symbol in Minoan Crete as the Cross is in Christian countries. "Labyrinth" applies specifically and specially to Knossos, but it might almost as readily have applied to Malia or Phaestos. I mention Malia particularly, because, as we observed, symbols based on the "labrys" were very common among the Mason's Marks seen there. Bull leaping team. A fresco found at Knossos. Bulls were at the centre of religious life in Minoan Crete (as indeed they had been in Mesopotamia in the preceding three thousand years). 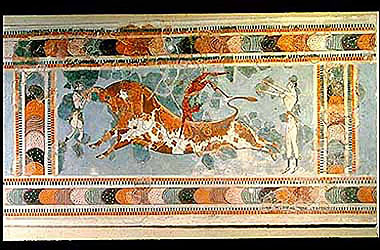 If the frescos at Knossos represent anything close to the reality of life there, the Minoan youth practiced a variant of the bull-fight in which the risk to the bull was negligible, but the risk to the human was considerable. One does not have to see the bull-leaping image as representing a static "photographic" representation in order to believe that some kind of athletic gymnastics was attempted with a charging bull. It may have been a religious rite as much as an athletic contest or demonstration. It is thought that there were special religious games in which the bulls featured prominently. Such games, if they were held annually or even once every few years, might have drawn the youth from a wide region to Knossos, as the quadrennial Olympic Games did in Greece more than a thousand years later. If some of those youths came from Athens, they were indeed being delivered to the Labyrinth. The second thread of probable fact comes from Mesopotamia, meaning Sumer. related states and regions from around 5000 BC up to the time of Minoan Crete. City-states such as Ur, Eridu, Uruk, Ashur, Ebla, and Byblos are relevant, to mention only a few cities that were culturally linked at some time between 3500 and 1500 BC. Part of a Sumerian seal from about 2000 BC. Rohl ,1998 inteprets the bull-man as Gilgamesh (Rohl,p170), but the bull-man image goes back to much earlier times. There are certain hints that the Minoan civilization might have been influenced by, or even descended from, the Sumerian / Mesopotamian civilization of a thousand years earlier. According to David Rohl (Legend: The Genesis of Civilisation, London, Arrow Books 1998), the Phoenecians and Canaanites who inhabited the coast of what is now Israel and Lebanon came from Sumeria (Ur, Uruk, Eridu) at the same time as others from the same region went to Bahrain and then to the Upper Nile, some time around 3000BC. If the Minoan culture was actually derived from the Sumerian, as seems not unlikely, it must have happened before writing became common in Sumer, around 3000 BC. Rohl's dates tend to be more recent than the conventional dates, so when Rohl mentions 3000 BC, he refers to a time conventionally dated rather earlier, perhaps 3500 BC. I consider more closely here the notion that the Minoan culture owed a great deal to that of pre-literate Sumer, or perhaps even descended from it, and that contacts were maintained with the Levantine coast, which was often part of Mesopotamian empires over the years. Sumer almost always had trading relations as far afield as Anatolia and India, even as far back as 4000 BC. It is therefore not unreasonable for the Classical Greeks to have attributed to Minoan Crete elements that their Mycenean ancestors had known from sea traders who came not from Crete, but from the Levant. 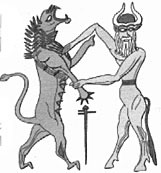 In particular, the half-man half-bull image was common in Mesopotamia for at least two or three thousand years before the destruction of the Labyrinth. It seems clear that the Labyrinth was known to the Mycenean Greeks, and probably the bull-man icon of the Minotaur was, too. It is also likely that the Myceneans would have known about the bull games. Maybe the bull games included bull-riding, as in a modern rodeo. If we remember that the natives of Central and South America thought Spaniards on horseback were a horse-man hybrid animal, it is not inconceivable that some Athenian visitor seeing bull-riding for the first time might have imagined the duo to be a hybrid monster. This notion is possible, but it is not likely, given that the Minoans traded all through the Aegean. More probably, the Athenians would have regularly sent delegations of youths to the games, from which some might not have returned either because of fatal mishap or because they chose to stay in the excitingly rich Minoan state, as did some Soviet athletes who visited the richer Western countries during the Cold War. Classical Greece began perhaps a thousand years later, after a period known as the "Greek Dark Ages," when the glory of Minoan Crete was a distant memory. There was little or no writing in Greek during the Dark Ages, and we have no records of any written history. Some oral history may have come down through bardic traditions from the Mycenean times to Classical times in Greece. It is quite normal for such oral traditions to personalise events, by attributing to a hero the affairs of a people. The downfall of Crete and the takeover of Greek administration might easily be personified as the overthrow of the Minotaur by a Greek hero. The name "Theseus" has been found on two Linear B tablets (necessarily of Mycenean time), identified as "Servant of the God" (Silver). So the legendary Thesues may have been based on a real individual, perhaps one of the first to visit Crete after the Theran catastrophe. According to the Larousse Encyclopeadia of World Mythology, and also according to Bullfinch, the heroic Theseus actually existed. He was a leader of Athens, and was able to bring together the city-states of Attica into an Athenian state. According to Larousse, this would have been shortly before the end of the Mycenian era, which actually was about 400 years after the explosion of Thera. However, his reputation might well have survived the Greek Dark Ages through the medium of bardic tales, and been attached to the Minotaur legend in the same anachronistic manner as some elements of Homer's Iliad. This same Thesues was said to have been one of the Argonauts who sailed with Jason on the quest for the Golden Fleece. If that story were also based on a real voyage a generation or so before the Trojan War, the date of the real Theseus would tie it in with my proposal about the underlying causes of the War, which I hypothesize to be interference with Mycenean Black Sea trade by the Trojans, whose city lies at the entrnace to the Dardanelles. However, one element of the Jason story puts the Argonauts at sea very close to the Theran explosion 400 years earlier, which argues that if that Theseus existed and was on that voyage, he could also have led a relief expedition to Knossos. Then again, since this is all complete speculation, maybe the Theseus of Athenian unification lived 400 years earlier than Larousse indicates, and, like so many of the legends, the Jason story is an amalgam of tales of different age melded into a single epic. the flight of Theseus with Ariadne and his strange abandonment of her on Naxosor Dia. I conjecture that these three elements, woven into a single story, represent quite disparate but related elements of Mycenean-Minoan relations. The "tribute" represents two things:(1) the dominance of the Minoans on the sea, and the relative subservience of the Athenians in matters of international trade, and (2) the actual regular departure of a shipload of Athenian youth bound for the Labyrinth, from which some might never return. If this annual (or biennial or quadrennial) shipload of Athenian youth actually occurred, the ship would probably have been Minoan. This dominance of the Minoans could easily have fuelled some resentment, if not fear, which could easily be transmuted in the bardic tradition into a personification of a fearsome monster. The shape of this monster would be dictated both by the religious partnership of man and bull, and by the previous existence of the man-bull iconography. It is no stretch to suggest that the youth going to compete in the Games became in the story a tribute to the monster Minotaur. Theseus (The Servant of the Gods) destroyed the Minotaur--the power of Minos--with the help of Ariadne, the daughter of Minos. 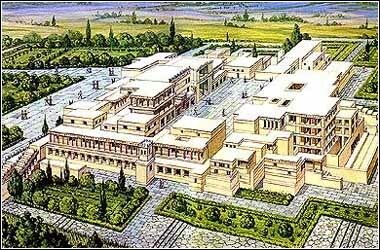 What may have happened was that the Theran explosion (the act of Poseidon) damaged or destroyed the Minoan palaces, including the Labyrinth at Knossos. It certainly destroyed the agriculture over the Eastern half of Crete, for many years, because of the ashfall. The civil administration must have been destroyed, and the Myceneans were able to impose their administration, either as a friendly gesture of disaster relief, or as an unfriendly occupation. The reference to the help of Ariadne suggests the possibility that at least some Cretans welcomed Mycenean aid, even though it cost them their independence. There may even have been a real Theseus leading the initial Mycenean investigative force, despatched when the Minoan ships stopped coming, though it seems more likely that the name of the later Theseus was attached to the legend during the intervening millenium before the story was written down..
Ariadne may represent Minoan culture. Possibly an outpost of it survived on Naxos for a period after it had been essentially lost elsewhere. I have no idea whether this notion is archeologically plausible, but it would fit this symbolic interpretation of the legend. Theseus (the Mycenean rescue power) aided Ariadne (the Minoan culture) to live for a while on Naxos. Although taken as a human story, Ariadne's abandonment makes little sense, taken as an allegory for whole cultures, it would have been quite impossible for Theseus to take Ariadne to Athens, whereas taking her to Naxos, where Minoan culture might have been already established, is plausible. Refugees from Crete seem to have gone to various other places in the Eastern Mediterranean. Some, for example, are thought to have been the Philistines against whom the Israelites waged a war of conquest. On the other hand, Homer's version is the oldest written version, and it has two components: Ariadne was put to sleep rather than simply abandoned, and this happened on Dia, very near Knossos. If we again treat Ariadne as a metaphor for Minoan civilization, it makes sense, since the Minoan culture did not die at the time of the explosion. Under Mycenean administration, it recovered on Crete and was administered from Knossos, which was the only one of the major palaces to be rebuilt.